If you looked at my wardrobe you might think otherwise~ It's a study in black and white with occasional pops of red. So let's head straight into the den~~ There's color out there! Really. We have colorful, non-traditional pieces throughout our house. They're entertaining and often personally meaningful. Like this piece by artist Nancy S Drew whose work made us laugh till our sides hurt because it echoed a "let's see and do everything" vacation that Mr I scheduled for us many years ago! Or, this Kent Ambler woodcut we saw at a Charleston, SC art festival two summers ago and couldn't resist. The print is fun, but the story behind the print was perfect. His neighbor, a retired farmer now living in the city, looked over the fence at Kent's bird feeders and declared, "Birds is like chickens. They eat n eat n eat." I was completely smitten and had to have it! All you chicken keepers out there in the blogdom might like the sentiment, even if the art doesn't appeal to you. I'm drawn to the monumental like Gaudi's mosaic creations, Sam Rodia's Watts Towers and Raymond Isidore's work La Maison Picassiette. Antoni Gaudi was a professionally trained architect whose works and vision were commissioned, but the story of the other two artists is a very different one~~Employed as unskilled laborers they were called to create with found objects. Every minute of their free time and extra income was devoted to their artistic vision. Their creations were larger then life, primitive and completely incredible to behold. I find their creativity, drive, and vision to be as remarkable as their works. 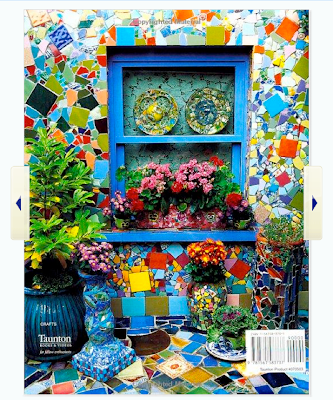 Kaffe Fassett and Candace Bahouth's mosaic book. Isn't it fun and just a little over the top! Seeing their work never fails to make me want to tile a brick wall on my patio! Alas, I have no monumental art installations at C&L! If you've been inside Chez Cedar you might wonder how someone who's able to replace a wall with reclaimed doors from the principal's office of an old Catholic high school or who has floored her bedroom with 4'x4' cherry plywood tiles and her den in 4'x4' sheets of birch plywood laid like giant tile pieces or designed a metal fireplace surround with an asymmetrical mantle hasn't created a big, fun garden project. I've made smaller mosaic pieces, a buffet top and have a glass on glass window on my front porch eave. But, my garden hasn't any mosaic installations! No pique assiette mosaics on a grand scale. I have never given myself permission to mosaic that patio wall or do a big fun piece. Fear of disapproval and it's partner conventionality have had way too much of a say! Other then pops of purple, the bottle tree and colorful birdhouse this garden's color is almost completely from flowers! In that delicious way the universe has of giving us opportunities to grow and learn~~Not being able to type has been a boon. It has given me a gift of time. Time to think about what matters most. Family, friends, gardening, health, blogging and growth....are all important. During this time, I've been reading and catching up on design blogs; mosaic books that I haven't looked at in years have found their way to my desk and to the night stand; project ideas are tickling my imagination. The drive to create, to make, to mosaic has been percolating. As soon as I can nip and cut tiles and glass I'll start on that Tree of Life glass on glass project that got shelved awhile ago. There's also a mosaic obelisk idea bubbling about...I'm thinking a trio sounds perfect. But I'll start with one! Maybe, that brick wall will get tiled! One thing's for certain~this is a good way to celebrate my 2nd blogaversary and start a new year of blogging... Deepest thanks and appreciation to all of you for your continued support and friendship. You are a gift to me. It sounds as if your creative juices have been flowing. I love the photo of your garden resting..soon if will be alive with color~~that Chicken painting is classic! It is lovely when the creative juices start to flow - and I look forward to seeing a mosaic joining the flowers at C&L. Time to think and ponder is time well spent. Happy Blogiversary! That's quite a bit of typing in today's post. Your hand is improving, I hope! I look forward to seeing your mosaic as you create it. You are so creative and talented that I believe that your head is spinning with so many ideas that you just can't decide which one to do first! Congratulations on your second anniversary, us 2-year-olds need to stick together. If you are interested I went to a local art gallery in my latest post, if not you should put down the keyboard and pick up the tile snips. You do have some monumental art pieces already, the trees. :) I can't wait to see what you do with your mosaic projects! Happy Blogiversary! Yes, color is very important! I used to also only wear dark clothes, but added color a while ago. I like it. It's fun! Monica, I do wear more then black and white~~there's gray and brown! I mentioned this to my BFF and she gave me a gorgeous pink scarf for Christmas! Congratulation on two years of blogging! Time flies fast doesn't it? Color is definitely what is needed these days. I'm tired of the gray overcast skies and colder than usual temperatures. I'm ready for normal February temps of 45! By all means go for the tiled wall. You are supposed to do it obviously. You have all this time to plot out what you want to do. I can't wait to see it. Congrats on your blogaversary. I can't wait to see what colorful posts pop up. Happy blogoversary, Gail! Love the chicken print. I too am drawn to mosaics. I wanted to make a mosaic countertop for the bathroom but then the husband said he thought future owners might not be as into mosaics as I am...so I settled for a mosaic lightswitch plate instead. Thanks for the much needed color jolt! JGH, Re-sell value is what talked me out of most of my projects...But, I think I will have to ignore that and mosaic the wall! Happy, happy blogaversary. I love reading your blog. That chicken picture is wonderful. I too, love mosaics also collage.I like to fit pieces of paper and string, yarn etc on a piece of paper and frame it..(if it looks good)Hope you continue healing. Congratulations on your second blogaversary! I'm so glad the time away from typing has given you new creative inspiration and energy. I can't wait to see your mosaic pieces. It might be "over the top," but I love that bright and colorful wall installation, and I personally think you should go for it. And I'm telling myself the same regarding a creative dream near and dear to my heart. On our deathbeds, we're never going to be wishing we'd been more timid and conventional and held back an ounce of our creative talents or potential! Congrats on your 2nd blog anniversary! You do have nice color. Love it all, especially the cardinal. H.
Gail, congrats on that milestone second anniversary. What a great collection of mosaic pieces, and your art work is lovely. These are beautiful examples of winter color! Of course, you know I agree with the sentiments expressed on the woodcut. Those chickens do indeed eat and eat and eat. Hi Gail, it seems like much longer than 2 years. I feel I've know you a long time. Congratualtions! I'm very careful with color indoors. Outdoors is where all my color is concentrated. My problem is I get tied of too much intense color inside. It is beautiful for a few months and them I don't like it anymore. Gail, what a wonderful post for your 2nd blogiversary, full of ideas and inspirations for all of us. May they come to fruition in your garden and ours this year! I'm inspired by the mosaic wall in particular ... I think I need one of those in my courtyard! Now that I've enjoyed the hobby of bird watching and feeding them for a few years, I know that saying someone eats like a bird is quite the insult! They definitely eat and eat and eat! Happy blog anniversary to you! Hi Gail....I do hope that you find the courage to show your artistic skills. Does it truly matter what others think, if you like it? Love mosaic.....have seen lots on my travels through Spain. Once you are up and running do share the mosaic progress with us. It is so inspiring to follow the creative process, then revel in the result with you! Happy Blogaversary from me too Gail! We started blogging about the same time ~ mine is on the 12th of this month. Resale stops me from doing a lot of projects also because I know I'm not in the house I want to stay in. Maybe you could do something on a small scale that could be moved? Interesting that you are a b&w clothes person. I would not have thought that from your garden! Happy Blogoversary! I hope you go for it! I'm sure it will turn out lovely and if it doesn't? Who cares? A delightful post, Gail. Blessed to see you back in 'top form', you are obviously getting on nicely, which makes us all smile :) Happy, happy 2nd blog birthday! Happy Blog-versary, Gail! Are you sure that painting shouldn't include a peahen? :-) A colorful one at that? I remember your posts on your mosaics. I also love the idea of doing mosaics and have just touched on the subject briefly. I think 2010 should be "the year," don't you think?? Happy Day!! Bless you Gail, and a very happy blogiversary! You're an ongoing inspiration to us. 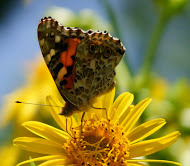 Enjoy your wonderful home, creativity, and garden endeavors, and please, keep sharing them with us! We love you and Clay and Limestone. Happy Anniversary to you. Like others I find it hard to believe it has only been two years....you are so accomplished. I too like color and by all means-- whimsy is a must!! I really like your Chicken art. It is pretty funny. Have a link to look for from a local newscast...will email it to you. Happy blogaversary! So tell me, what's stopping you from buying a blue jacket, lime green scarf, and purple purse? Us little old ladies have to reclaim our colored clothes (and I mean it, sitting here in a pair of orange pants as I type). Glad your time-out was such a boon to your creative juices. Hope you'll feel better and better. Two Years? Time Flies, time flies. There truly is always a silver--or in this case, a rainbow-coloured--lining to every cloud, and I'm glad that while we were missing out on your posts, you were exercising your creativity in other ways. Definitely, go for making that mosaic wall in your garden! I'll back you up on it. Anyone gives you sass, tell them I said it's a brilliant idea. Happy blogaversary, Gail, it's a delight to be able to call you one of my blogging buddies. And one of these days I hope we'll actually get to meet, too. Here's to many more years of blogging--pain free, too. Happy blogiversary, Gail! And YES, make some art for your garden. I can't wait to see what you come up with. Whatever it is, it will make the garden even more "you," which can only be a good thing. Thank you for the first photo. The flash of cardinal against the dark branches and bright snow was starkly lovely. I'm with you on mosaics. The idea of a mosaic garden wall, a piece with year-round color and movement, is genius. Congratulations on your second blogoversary. Hope you'll continue to share for many more. Congratulations on your second blogaversary, Gail! It doesn't seem possible that nearly two years have passed since I first "met" you in the blogosphere. Your posts are always uplifting and enjoyable, just like you, Gail. What a treat it was to meet you in person at Spring Fling and this past fall to see Chez Cedar in person! I can relate to your lack of eye-catching art in the garden. I have no artistic eye, and I'm afraid to do something in the garden that might wind up looking completely out of place. But your mosaics sound like such a great idea and with your vision and research, they should be a bright addition to your garden. Go for it! PS Gail, I've seen pictures of your fireplace, but not of the other features in your house that you mentioned here. Would you be willing to post pictures? Congrats on yet another anniversary in Blogland! How funny you talking about wearing black and then pop it with a bright color. That was what Marie Osmond was talking about on the Today Show yesterday! Black basic slacks and top with colorful scarves, belts, purses, etc. I think our colorful whimsy in the garden to be the belts, scarves and purses! Ah, that bird sure is trying to get into the big house. Better be careful or you will be making her a nest in the middle of your living room! I know I would be. lol, Get that hand well soon as you have so much in mind to give it a work out. And yes, Go For It! Gail what a wonderful bright post filled with such positive energy on such a grey winter day! I get so excited when the jays or the cardinals color my winter garden! I love your bottle tree I think I've commented on how much when you posted once before! Great idea for color in the winter garden!! 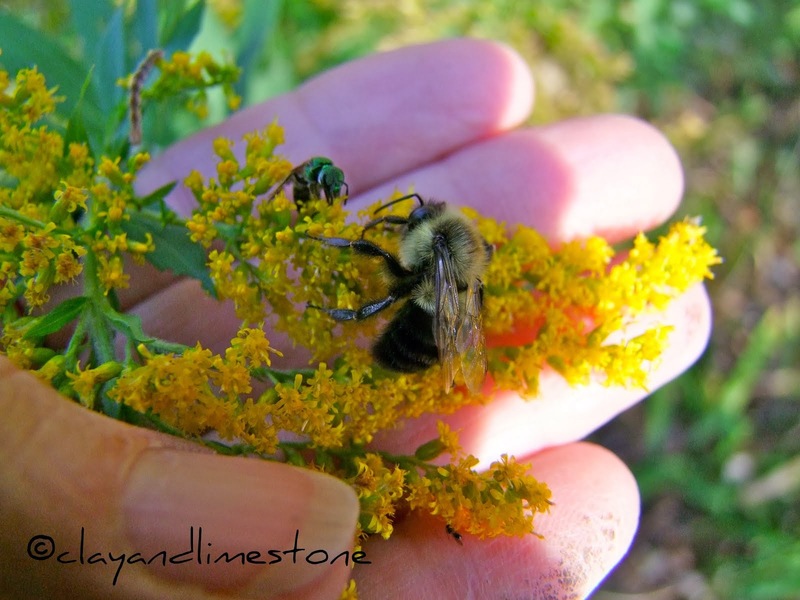 Congratulations on your second year of blogging.It has been a Joy to stop by and get to know you and your garden! Thank you for your caring while I was focused on my healing journey..
with the help of my garden friends such as you..I triumphed! Happy Blogaversary Gail. I wish for you only the most beautiful colors in life and garden. An obelisk sounds like fun. Can't wait to see your creativity at work. Yes, yes, we must have color to brighten the winter monochromes! Doesn't the red of the Cardinal gladden your heart? I love it! The little Cardinal ladies are pretty too with their softer hues. It seems this down time has been good for your creative mind, giving you the incentive to "go for it". I can't wait to see the results! I, too, love color in the home and the garden. I really hope you will keep those creative juices flowing and make some new mosaic pieces. How much fun it would be to see your art in the garden. : ) An obelisk sounds wonderful for the garden! Glad to see you are able to type again, sending more healing thoughts in your direction. Thank you for the amazing post! I am inspired by Antoni Gaudi as well. Can't wait to see the Tree of Life and the mosaic obelisk. Dearest Gail, congratulations on 2 yrs. of blogging. It doesn't seem that long. As always I thoroughly enjoy reading your blog & seeing your garden. Do get the strength back in you hand so you can continue to create all those ideas you have running thru your head. I know each will be a master piece. I really love your bottle tree. That is the shape that I would like to have. Did you have it made or did you order it? The top bottle says it all. Happy Blogoversary! I love mosaics. I can't wait to see how your projects turn out. they may be able to tell you were they got it. The gift of time. You have made good use of your healing time. Creativity is a wonderful gift as well. I would SO love to nip and cut tiles with you. Mosaic is a love I have also and never seem to have the time to do it either. The colorful pieces in your home speak volumes of your eye for art and meaningful, symbolic design. Your chairs and bottle tree and cardinal are really a stand out with all the snow TN has received this long winter. And your flowers in summer are to be prized for their wonderful displays of color and texture. Beautiful post. Beautiful Gail. Congratulations on two years of adding value to so many gardeners lives... especially mine. Healing prayers are still ongoing. Congratulations on your second blogiversary Gail! You're truly a blessing to the garden blogging community. The universe's gift to you of time for reflection, learning and growth becomes a gift to us, your readers as well, as you share these insights. Begone, fear of disapproval and it's partner conventionality - life is too short for the two of you! May you soon be able to realize your vision, and create those garden mosaics you're percolating as you heal. I have been so preoccupied, that I haven't been blogging much, either. So, how did your surgery go? Are you healing well? White is a color, isn't it? LOL I am ready for all of those blooms to be providing their colors, too. Happy blog anniversary, by the way! I'll immediately seize your rss as I can not in finding your e-mail subscription link or e-newsletter service.